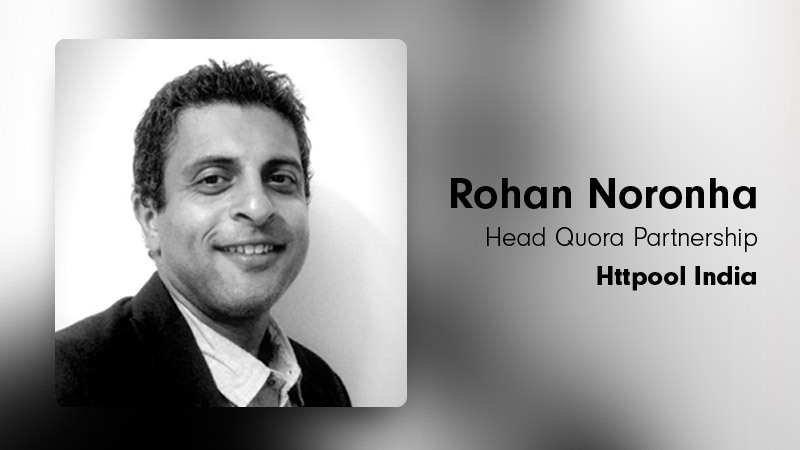 Httpool announced the appointment of Rohan Noronha as their Head of Quora partnership at Httpool India. Rohan joins Httpool from Twitter India where he was a Sr Client Partner. He brings with him 20+ years of rich experience of having worked with media houses like Dainik Bhaskar, Carat India, UM7, Mindshare, Komli across functional areas of media planning & buying, sales & sales strategy & digital marketing. Httpool partnered with knowledge sharing platform Quora as their official and exclusive ad sales partners for Quora Ads in August 2018. Httpool will be their expertise and advertising support to brands and agencies in India. In his new role, Rohan will be spear-heading ad sales for Quora in India and will be leading a team across the market, to reach out to advertisers & agencies to leverage Quora Ads solutions to amplify their marketing objectives.